Red: When the surface is nearly completely red. In New Mexico about 65% of the chile-eaters prefer green chile to red, but remember, they are comparing a fresh immature fruit to a dried red, mature fruit. If the comparison were made between a fresh green fruit and a fresh red fruit, the preference would be closer to 50-50. During the ripening process, plant fruits emit a natural ripening hormone, ethylene (C2H4). Ethylene is unique in that it is used in the manufacture of polyethylene plastic sheeting and also is used commercially to force ripening in plant fruits, particularly bananas. 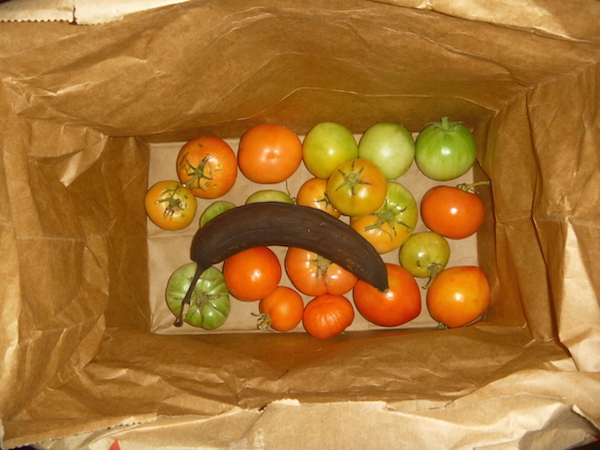 Ironically, bananas can be used to both trigger ripening and to force other fruits to ripen faster. During the end of the growing season, the first frost often happens when many of the peppers and tomatoes are still green on the plant. Thus the foliage is destroyed but not the fruits. 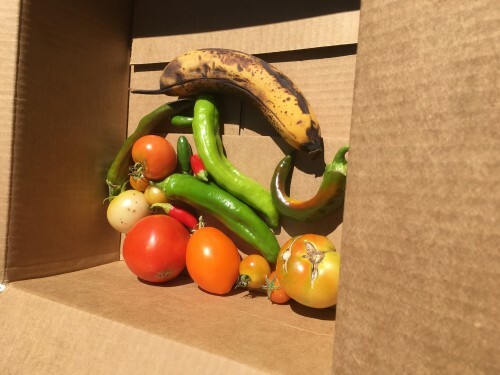 I harvest all of these green fruits and attempt to force them to ripen by placing them in cardboard boxes (usually the medium ones from Amazon) and adding one or two ripe bananas. Then I seal the box for at least a week. The fruits in the breaker stage always ripen to red, and many of the ones in the green stage will also turn red because they have been “triggered”—perhaps by the colder temperatures—and are producing small amounts of ethylene but the red has not yet shown up on the surface of the pod or the tomato. The fruits most likely not to turn red are usually the small, immature fruits that have not yet been triggered. By concentrating the ethylene to trigger ripening, you are effectively extending your harvest.